This is what people are saying about the studio! My son just started playing about a year ago. I'm amazed at how for he has come since then. He has NEVER complained about going to his lesson or about practicing. Thanks Daniel for making music fun!!! My daughter has been a student at the studio for a year now. She is always happy to go to lessons and excited when she comes back out. It is so important for children to enjoy an activity in order for them to learn well and stick with it. Daniel makes the lessons fun and is so encouraging that my daughter has been progressing very quickly. I love working with M! Thanks for saying! 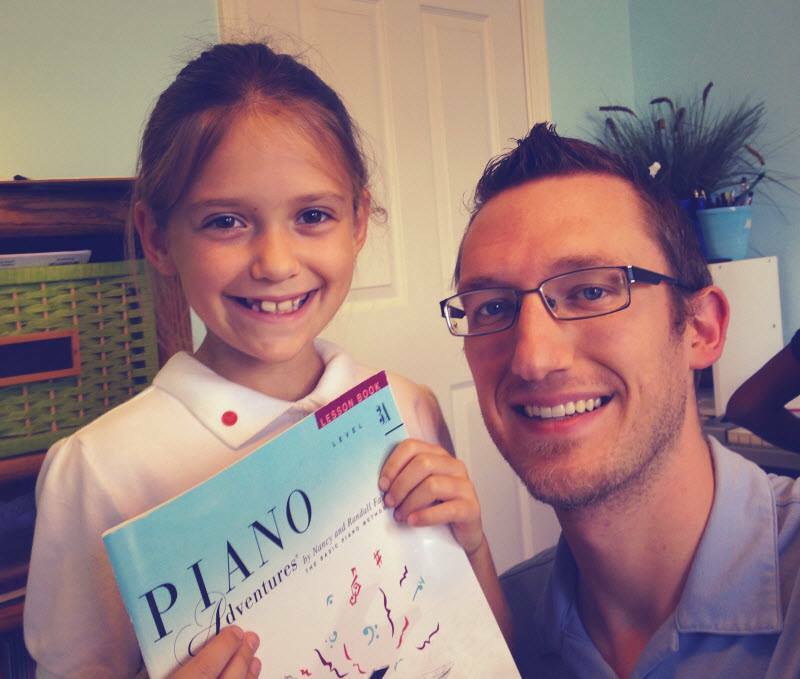 Daniel’s creative, upbeat style of piano instruction has kept my four children encouraged and motivated for the past three years. They’re progressing in their skills and in their love for the gift of music. My daughter has been a student for about 9 months and I am amazed with the growth I can see and hear in that amount of time! Me. Patterson is very professional, and creative and makes the lessons fun and engaging. I look forward to hearing my daughter’s new songs each week. My son has been a student with Mr. Patterson for over a year now, and he has learned so much. I love that every time the lesson ends, he is so happy and motivated he is humming the tunes all the way home. He takes flute in school, and he is always eager to play the songs on the piano. Mr. Patterson has a way of teaching that makes a positive impact on my son! Thank you so much! I love working with him! My son began taking lessons with Mr. Patterson this summer after his instructor of 7 years retired. We were anxious about finding someone who could continue to help him excel in his muscianship. We were delighted to find Mr. Patterson's studio. He has quickly made a bond with my son and knows how to push him to grow in his skill, knowledge and love of music. Thank you, Denise! Kyle has fit right in here... Excited to continue working with him! My 2 kids have been taking lessons at Mr Patterson's studio for over 2 years now and they are doing wonderful. They have learned so much! Both of them did very good on their Royal Conservatory exam. Mr. Patterson is an amazing teacher! I have had two children take lessons from the Daniel Patterson Music Studio. Both learned the love of music and have gained confidence. Daniel Patterson is such a wonderful, encouraging teacher. He shares his love of music with all his students! My daughter has been taking lessons for over a year, and she loves playing the piano. Learning the piano has helped her math skills, and it is an amazing stress reliever for her when she is having a bad day. I feel very lucky that Daniel Patterson Music Studio has been able to show her joy with music! I think it's something she will enjoy for the rest of her life. My son has been taking lessons for over a year and I am impressed with how much he has learned! He was 5 when he started and was picking it up so quickly he was flying through his books! I'm really glad he is getting this opportunity to learn how to play the piano from a teacher that understands kids how to best teach them.